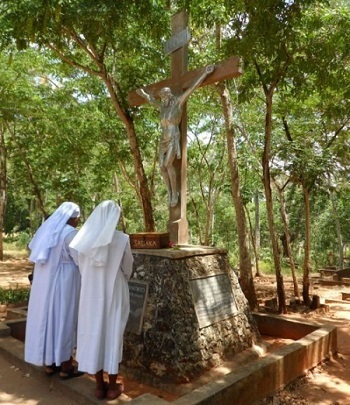 Several days before January 10th the Catholic radio station repeated frequently the call that all priests, religious and lay people are to join Cardinal Polycarp Pengo in the pilgrimage to Pugu for a worthy celebration of 125 years since the destruction of the first house of the Benedictine monks and sisters. 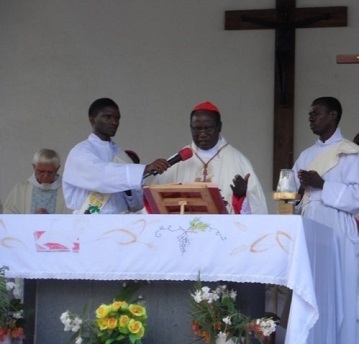 Cardinal Pengo sees Pugu as the cradle of the Catholic faith and participates in the annual pilgrimage of the Archdiocese whenever he is in the country. Actually every year there is a pilgrimage to Pugu, usually on January 11th as this is a public holiday. The real date is January 13, 1889 when Pugu was attacked by Bushiri. 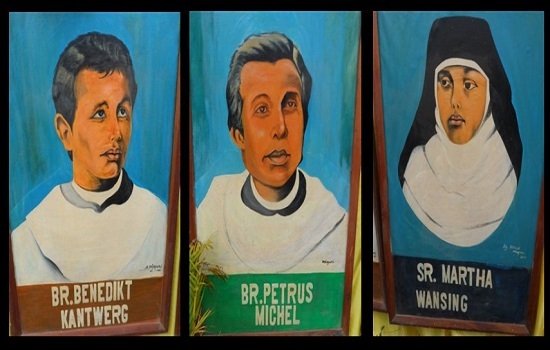 Brother Benedict, Brother Peter, and Sister Martha Wansang lost their lives together with some orphans. This year it was special and a crowd of about 2000 faithful assembled led by His Eminence Cardinal Pengo together with his two Auxiliary Bishops, all four Benedictine Abbots including male and female Benedictines from all over. 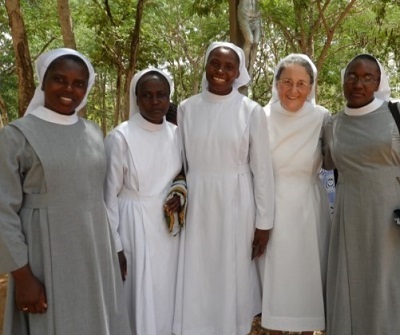 On our way by car from the Procure of the Benedictines in Kurasini we saw many Catholic women with their blue and white khangas heading to the place. The Cardinal blessed the whole crowd with holy water starting from the small chapel. Many stood in front of the cross opposite the Chapel where the names of our deceased are written. They prayed in silence with great reverence. Between the natural stones below the cross several small papers could be seen. They are prayer petitions by people who believe in the intercessory power of our proto-martyrs. From there, there was a long procession to the open air altar. Painted canvas pictures of the Brothers and Sr. Martha were displayed before the altar. The Abbot of Mvimwa gave the homily. At the end the Cardinal expressed his joy to see more Benedictines than ever before. “This is your place, I hope I shall see you here in higher numbers every year,” he said. His second concern were the different parties now already campaigning to become leaders in the elections which are up for the next year. He observes that they are not looking for the common good of the people but for their own profit. All were so quiet when our Cardinal spoke from his very concerned heart. At the end papers were given to parishes in order to fundraise money for the improvement and maintenance of the place. “This is your place; there are no other donors except yourselves. We do hope that our pioneer missionaries pray for all of us, that our hearts are again on fire for Jesus as our Pope Francis does not get tired to tell us,” he said.